The attacker must attack with a knife or razor. I’ll stop here. You can see the point. Even within the movie, the filmmaker has a hard time confining all murders to a knife or razor. It is an untenable definition. And seriously limiting as well. Which is why I thought I’d relook at the definition, and come up with my own. 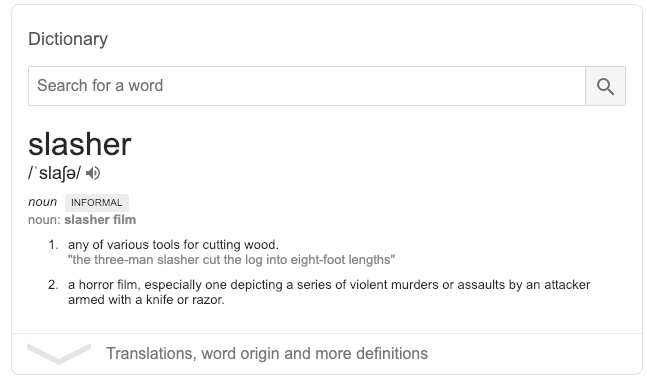 We don’t seek to classify them as slashers, so the definition must get narrower than just ‘body count’. No ghosts (in its broadest definition), demons, vampires, werewolves, etc. No animals, aliens, or plants, etc. No non-humans or superhuman creatures in human form. In other words, for me, if a film has to qualify as being a slasher film, the killer(s) must be a human being as we understand it. This is a better definition than the Google one. We are not restricting the type of killer as long as it is human. Why should the killer be human? Why not one of the three exceptions listed above? The problem is the slippery slope. By including fantastical or supernatural elements, then any horror movie is also a slasher film. You have to remember that slashers don’t always confine themselves to murders by knives or sharp instruments, and more importantly, slashers don’t have (and cannot have) a monopoly on murders committed by knives or sharp instruments. So, movies like The Invasion of the Body Snatchers, Jaws, Alien, Predator, The Terminator, Nightmare on Elm Street, Carrie, etc., are not slasher films. I know, for many, Nightmare on Elm Street is a slasher. It is a particularly touchy subject. But Freddy Krueger isn’t human (he died and is a ghost), so according to my definition the movie isn’t a slasher film. The point is, as I’ve made above, you let one ghost into the slasher genre, then all the other ghosts must be allowed in as well. That isn’t the way to define anything. In many ways murder mysteries have body counts and many have murders committed with sharp instruments. But we don’t consider them as slashers. Why not? For me, the main difference is a slasher focuses on the murder, draws it out. The murders are creative for its own sake, and often even outlandish. A simple gunshot or stab isn’t really enough. In other words, a slasher film very clearly leans towards the horror genre. We are supposed to be scared. If a slasher film has to have multiple drawn-out murders by a killer who also relishes in horror, then it tells us something definitive about the psychology of the killer. Killing is not just a necessary evil, but also a psychological one. The killers in slashers tend to be serial killers, or at least maniacal to a large extent. They are not “average individuals” trying to hide their crimes. Before we conclude with our definition, we have one more important classification to make. The killer’s identity is known. There are important ramifications to classifying movies this way. It also changes the perspective of the film. If you know who the killer is right from the word go, the film is more of a horror movie where survival is more important. The question is: Who will survive, and how. In mystery slashers, the bigger question is: Who is the killer and why? The reason this is so is because until you know who the killer is, you don’t really know why they are killing as well. You know people are going to die, but your primary interest is always the identity of the killer. If you strip that away, then the interest shifts to the characters about to die. The perspective makes all the difference in how the film unfolds. E.g., Black Christmas is a mystery slasher, but Halloween is a horror slasher. Psycho is a mystery slasher, but Peeping Tom is a horror slasher. Similarly, The Texas Chainsaw Massacre is a horror slasher, and so on. have a killer whose identity can or cannot be a mystery. If it is, it’s a mystery slasher. If it isn’t, it’s a horror slasher. 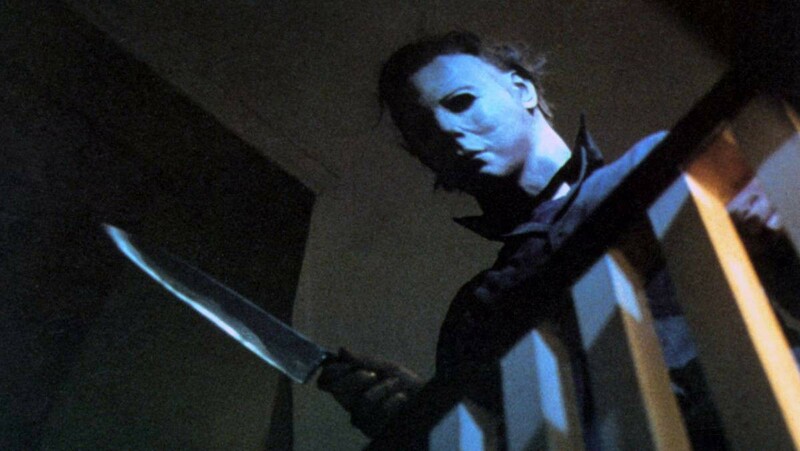 Halloween (1978) – It’s the perfect slasher in every which way. Deep red (1974) – A brilliant mix of music, colors and atmosphere. Style and substance. Psycho (1960) – I don’t think I need to say anything about this, except it is the first movie to influence the modern slasher. Black Christmas (1974) – You never see the killer, ever. Yet, you are scared. 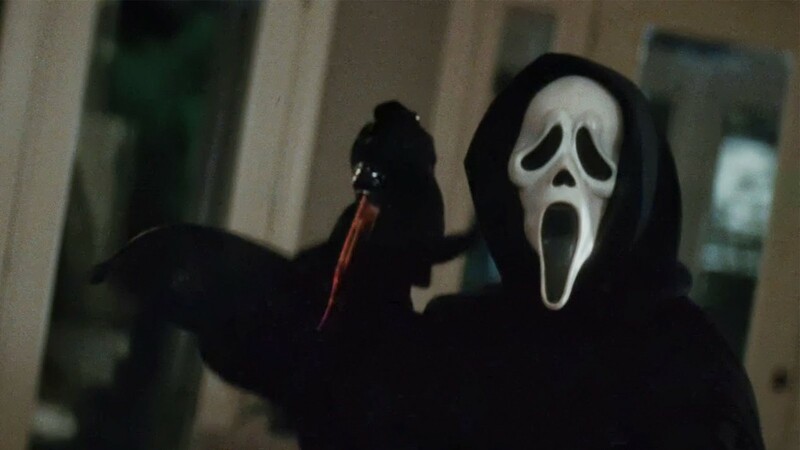 Scream (1996) – This is the movie that actually brought the word ‘slasher’ into popular consciousness. Unfortunately, it is also the movie most people define slashers by. I hope you found my list useful as a great place to start studying about slashers. If you don’t agree with my definition, that’s fine. Ultimately, film genres never fall into perfect slots, and are not easily defined. So there’s bound to be disagreements. The best example I can think of is Dario Argento’s brilliant masterpiece, Suspiria. It has all the makings of a slasher except one. Which is why in my book it isn’t a slasher film, while Deep Red is. Please feel free to disagree with me in the comments below!